DISTORTION CONTROL - adjusts the amount of input gain. VOLUME CONTROL - sets the output level. SCOOP TOGGLE SWITCH - provides two settings of attenuation in the middle frequency range. In the up position, the mid attenuation is high. In the middle position the mid attenuation is low. In the down position there is no mid frequency attenuation. 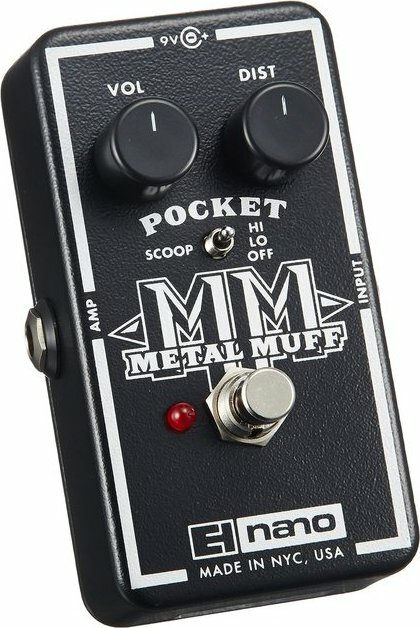 FOOTSWITCH - Selects whether the POCKET METAL MUFF is engaged or bypassed. The corresponding LED will be lit when the pedal is engaged, and dark when bypassed. INPUT Jack - This 1/4” jack is the audio input to the POCKET METAL MUFF. OUTPUT Jack - This 1/4” jack is the audio output from the POCKET METAL MUFF. When the POCKET METAL MUFF is in Bypass mode, the OUTPUT jack is connected to the INPUT jack through a buffer. Power, from the internal 9-volt battery or external battery eliminator, is activated by plugging into the input. The input cable should be removed when the unit is not in use to avoid running down the battery. The input impedance presented at the Input Jack is 1Mohm. The output impedance at the Output Jack is 600 ohms. The barrel connector on the front of the POCKET METAL MUFF is for a 9-volt battery eliminator capable of delivering 100 mA of current. The inner ring of the 9-volt battery eliminator must be negative, the outer ring positive. The unit’s battery may be left in or taken out when the eliminator is in use. To achieve its biting distortion, the POCKET METAL MUFF has very high maximum gain. This requires that both the pickups and cables be well shielded and properly grounded to avoid excessive hum when high sustain control settings are used. To change the 9-volt battery, you must remove the 4 screws on the bottom of the METAL MUFF. Once the screws are removed, you can take off the bottom plate and change the battery. Please do not touch the circuit board while the bottom plate is off or you may damage a component. The optional 9V power supply from Electro-Harmonix is US96DC-200BI (same as used by Boss (tm) & Ibanez(tm)) 9.6 volts/DC 200ma. The barrel connector on the front of the POCKET METAL MUFF is for the 9-volt battery eliminator capable of delivering 100 mA of current. The inner ring of the 9-volt battery eliminator must be negative, the outer ring positive. The unit’s battery may be left in or taken out when the eliminator is in use.